BACK IN TOWN! DJ Hands Solo in Fratelli Lounge &#038; Club! BACK IN TOWN! DJ Hands Solo in Fratelli Lounge & Club! This Friday, the 21st of March, we present a good friend and one of your favorites DJ BACK IN TOWN! Put your hands together for DJ Hands Solo back again in Timisoara! He is a regular in the VIP hotspots of St. Moritz or in the hottest venues of New York and he’s toured Asia six times as Tokyo, Shanghai, Hong Kong, Singapore or Taipei enjoyed his music! Berlin, Barcelona, Vienna or Prague are just a few places where his European shows took him! He played alongside all time greats like Grandmaster Flash, DJ Premier, Jazzy Jeff, Mark Ronson and Dizzee Rascal and opened arena shows for Enrique Iglesias. His client list includes high profile brands such as Nike, Moët & Chandon, BMW and FIFA. 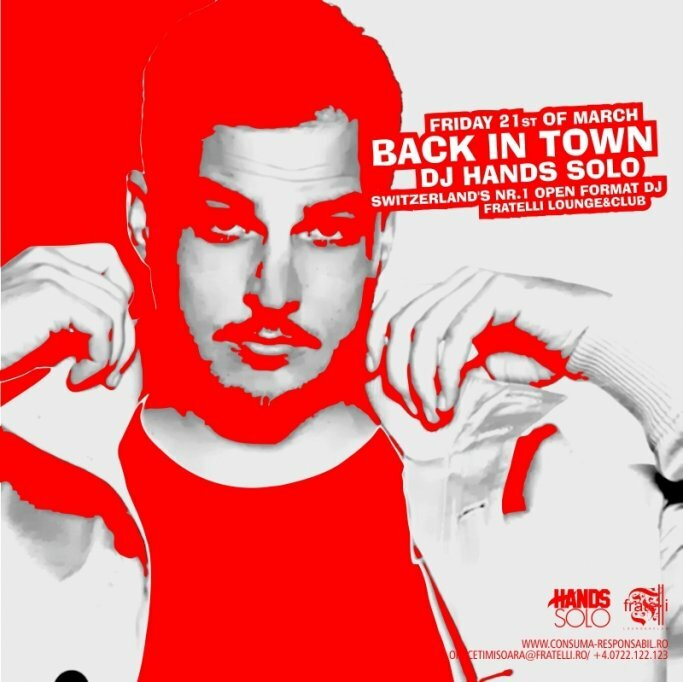 In 2011 Hands Solo received the Swiss Nightlife Award for best Open Format DJ, thus solidifying his spot at the forefront of the urban Swiss DJ scene. In his hometown of Zurich he holds residencies at two of the World’s Finest Clubs, Amber & Jade! But all of the fame he has experienced for years stems in front of his unique flair for music! Let’s enjoy his visit to Fratelli Lounge & Club this Friday, the 21st of March, starting with 11.30 pm!